When your child is sick, it is all you can think about. Your focus is only on helping your son or daughter get well. Extended stays in the hospital are stressful for everyone. The last thing you usually think about is a healthy meal. "I visited with friends and staff who are having a similar experience...I enjoyed a meal and did not have to purchase anything. I am grateful for the love and support received along this journey." "I was able to stay close by my daughter while having lunch. Not having to leave the 7th floor gives me peace." "I am very grateful [for the] fellowship food provides. I feel [the] warmth of Roger [and other] parents sharing humor, laughter, and kindness." 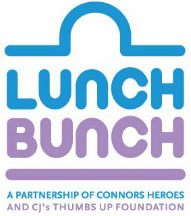 In partnership with Connor’s Heroes Foundation, we provide weekly meals to families of pediatric patients at UVA Children's Hospital in Charlottesville on Wednesdays and Children’s Hospital of Richmond on Thursdays. The average cost of one day's worth of meals for our Lunch Bunch Program is $300. If you have a business that would like to sponsor or donate meals, either in-kind or at cost, please Contact Us. We also provide meals at Ronald McDonald House of Richmond a few days a month. Meals are prepared in-house for about 20 people. This is a great volunteer opportunity for Scout troops, service organizations, and individuals who enjoy cooking for others.